"Church's moved to Bures shortly after we started farming in Covington - September 1912. They, like us, have traditional values and aim to produce the best quality products for their customers. Their reliability and honesty makes trading with them easy. Our good trading relationship is borne out by the fact that we have grown vegetable seed crops for Church of Bures for more than 30 years. Over that time we have grown a variety of crops, but in recent years have concentrated on Cress, Mangel Seed and Broad Beans. Seed growing has always been practised on our farm but was really taken forward by my father, Richard, who completed a Nuffield Scholarship on the subject in the 1970's. I am keen to carry on this way of farming as long asa the profitability allows and am always looking at new crops and ways of doing what we do better. Working alongside Church's going forward will enable us to do this". One of the greatest and most regrettable changes I have witnessed in the business of farming over the last forty years has been the disappearance of personal service and the opportunity to talk to the people who can make instant decisions. Computer systems have some benefits but how frustrating it is to dial a number and an automated voice asks you to press a series of buttons. If you are lucky enough to avoid the usual ‘all our advisors are busy’ signal you may get through to an actual living person, but often one who regards you as another number in a sea of computer records. How lucky we are to be able to ring 01787 227654 and hear that happy voice proclaim ‘Church of Bures’. Next minute you are through to decision makers who still have a couple of minutes to talk about the state of the world before realistically discussing crop prospects and prices. Since those heady farming days of the sixties when the public valued local food and local growers, we have lost a lot of genuine friends from our industry. On many occasions a chat and a handshake formed the contract. Since then legislation and sharp practice has made life difficult for merchants and farmers alike and many have found the strain too great. Church of Bures has survived by streamlining and diversifying without losing that personal touch. Big enough to compete yet small enough to care has been their philosophy and farmers should value that ethos. Few industries can talk to their trading contacts and know that they will do their utmost to give a fair deal. Long live Church’s! A visit to the period offices of W A Church in Bures Ltd High Street is recommended. The solid oak door leads to a wooden staircase worn by generations of seedmen. The welcome is genuine and warm, giving the opportunity for a considered and informed discussion on the markets of the day. The strong feeling of tradition here is in contrast to the modern facilities out of town at the High Fen store. Here the latest technology is employed for the efficient processing of a range of seeds and crops. Family farms have always appreciated the opportunity to trade with family run supply businesses. 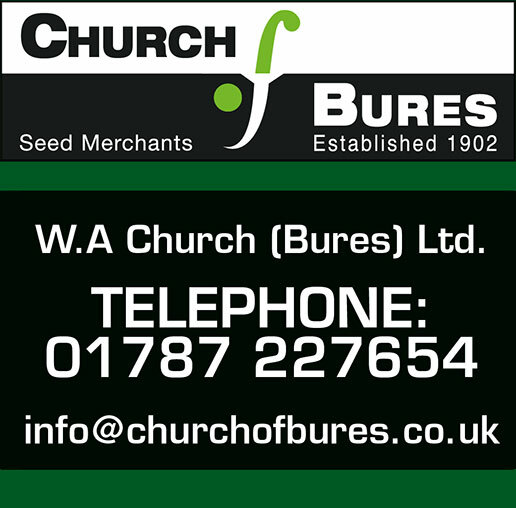 It is no accident that W A Church (Bures) Ltd has supplied farms and the trade for over 100 years. Their hard earned reputation has been maintained through the delivery of quality products, combined with excellent service and sound advice. So why bother continue the search? John’s family came all the way across the river from Canewdon in 1952 to settle in Southminster! They started with 1200 acres and today they are farming about 3000 acres. We are very grateful for the good working relationship with him. I have grown Maro Peas for Church’s for a number of years with Kit Motion as my main point of contact. The company is always a pleasure to deal with, and if any problem occurs throughout the season they will bend over backwards to help out. This has led to a very special and enjoyable relationship between grower and producer. On my recent visit to High Fen Seed Store with my son Ben. I was impressed beyond belief. We were shown the many procedures of cleaning and grading the various seeds and pulses for the specialist markets. The use of ‘high tech’ machinery works alongside tried and trusted ways that have passed down through generations. Most evident to us was the feeling of pride from both the staff and the management at every level of the process. Attention to detail and loyalty to the standards of the company from all involved assured high quality products are guaranteed. I have been farming for nearly twenty years at Deal Hall and I am the third generation of my family to manage farms for Strutt & Parker (Farms) Ltd. I have been growing Peas for Church of Bures every year that I have been here, with the majority being Maro's for either seed or the Japanese market. In this time, we have managed to win the BEPA National Marrowfat Pea Growing Competition twice with samples of Maro, which we still get on very well with and can still get good yields and with their premium price we can make very healthy returns. I have always found, that dealing first with Anthony Church and now with Robert Church and Kit Motion, is more of a partnership than a typical trading contract that we have with the larger merchants and this always shows through when any little hiccups that occur, can quickly and amicably be resolved through a quick telephone call and I look forward to trading with them for many years to come. Alan farms 3700 acres, as a farm manager for Strutt & Parker (Farms) Ltd at Burnham-on-Crouch which is on the Essex marshes. He has been a manager since 1994 and his father Tony before him for in excess of 50 years! We are delighted to have such a close working relationship with Alan, and he has been growing MARO PEAS for us now for 18 years. His crop is consistently of a very high standard and we are able to export them to Japan for snacks every year. We look forward to many more years of trading together.